How do you pick your Soap of the Week? SotWs are selected from three groups of flickr pools that I am on: Cold Processed Soap, Handmade Soap, and Soap. 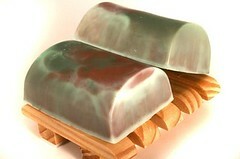 Each week I randomly select which pool to search through and find a striking soap to feature. The picture is usually professionally done, the colors are attractive, and the scent sounds desirable. Also, it has to be able to be blogged so if you post to those groups and you'd like me to take a look please make sure your privacy settings allow for the image to be blogged!